With Whitebeard injured, the Navy launches a counterstrike to finish the pirate rebellion once and for all. And as the three Navy Admirals stand in his way, Luffy will need one last trick if he hopes to save his brother Ace from being executed. 4.0 out of 5 starsFinally, a book that is part of a series. If you like this, you will like this book. Had hoped for story to be based more on the Hulk. However, it did leave out that dreadful Red Hulk crap. Red Hulk is stupid, and the author took a stand, in not putting that douche bag in this fine book. The One Piece story continues with a new arc, and the story is just as grand, humorous, and emotional as ever. This new arc brings with it many new characters and a serious story revolving around the subject of racism between humans and fishmen. The characters are still great, the world is expansive and beautiful, and the story is rich and detailed. 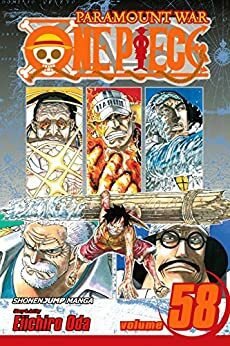 At 62 volumes, One Piece is still as great as ever.